The weather was foul as my granddaughter Hannah and I headed to Elland Road showing that this storm showed no signs of abating. With flooded roads to contend with on the way home, I’ll be glad when the weather improves. At least we didn’t have snow like Northumberland and Scotland though. For once it wasn’t just the home crowd that was sold out as Sheff Utd had sold all their tickets too so we were looking at a full house. I’d seen on Facebook that a couple had arrived from Malaysia for their honeymoon on what would be their first visit to Elland Road. Unfortunately I didn’t manage to catch up with them for a photo but hope they had a good day. I was also meeting Mark in the Peacock which I’d assumed was to take his photo. 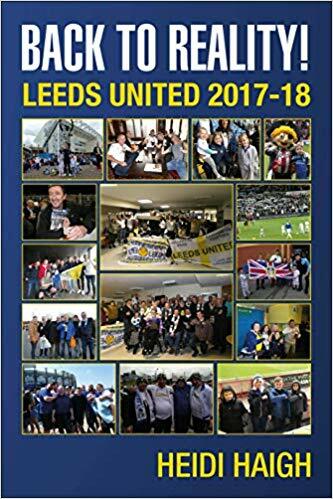 It turned out that I was to take part in an interview for the documentary 100 years of Leeds United which was a surprise, but of course I did that. I heard someone shout something about two magpies when they passed me outside the South Stand. Prior to Mark arriving I was talking to some lads one who had read my books and said he had enjoyed them. Thanks for the feedback which is appreciated. Hannah wanted to go into the ground early so I made sure she got through the turnstiles before going and renewing our season tickets. Now the paper copies had come through I was able to renew them as the auto cup scheme can be chosen, whereas online you don’t get that option. I have sent the suggestion to the club for the auto cup scheme to be added to the online renewal because it would make it easier and I know I’m not the only one who waits for the paper copy for that reason. The team: Casilla, Ayling, Cooper, Jansson, Harrison, Phillips, Klich, Bamford, Roberts, Alioski and Hernandez. Subs: Douglas for Harrison (57), Clarke for Klich (77) and Dallas for Ayling (77). Leeds lost the game 1-0 and had Casilla sent off in the second half. Attendance was 37,004 with 2,641 Sheffield United fans. As the game kicked off there was a minute’s applause for Bill Fotherby who died this week. He was Chairman of Leeds during our promotion from the Second Division and winning the title in the First Division which saw Leeds as the Last True Champions. Leeds started off on the attack before getting a further opportunity a few minutes later when Bamford’s shot was blocked. It looked like he tried to place the ball rather than hit it hard which may have resulted in a better chance. We had another great chance with Harrison but unlucky for us he volleyed the ball over. We kept the pressure up and it was a case of hoping we didn’t rue the missed chances as we were unable to put the ball into the net. We had limited Sheff Utd to a few attacks but then just before the break we were passing the ball across the back but we didn’t seem to know how to take it forward. With that Sheff Utd got the impetus and nearly made us pay as they were unlucky not to score in the final minutes as they upped their attack. They should have been pulled up with a hand ball for one of them and offside for another but got away with both of those decisions. I was glad for the half time whistle to blow but felt by messing about at the back we had given Sheff Utd some hope. At times we had not taken the swirling wind into consideration although Alioski managed one great pass across the pitch. At the start of the second half as we were attacking towards the Kop, I couldn’t help but notice their players were built like brick “s**thouses” or so the saying goes. It felt a bit like men against the boys (us) when I compared the players as they were hard to fight off at times. We did have a great chance to take the lead when a great attack saw Klich get to the byline to cross to Roberts only for his shot to come back off the post. That was probably our best chance of the game but that started my stomach churning as that familiar feeling that we weren’t going to score came over me. Unfortunately it did come back to bite us as Sheff Utd took the lead when Sharp got the better of Cooper before he passed it to his player to score. That said we did keep on trying and were attacking when Sharp elbowed Jansson who went down like a ton of bricks. Sadly for us that slowed the game right down and lost our momentum. Sheff Utd were closing us down quickly though which didn’t help. Clarke came on in a double substitution with Dallas. He got to the byline and passed the ball across the goal only for Jansson, who at this time was playing up front, hit the ball past the post. Leeds were still going in search of an equaliser which I’d have happily accepted at this late stage only to be caught out on the counter attack. This time Phillips was overcome and as Sharp ran past him, Casilla who was way out of his area came out and brought him down and was given a straight red card! Down to 10 men but with still a few minutes left plus injury time, saw Jansson go in goal. We survived the free kick and in the last minute when we were awarded a corner, Jansson came out of goal to join the attack but to no avail as Sheff Utd got the win. Unfortunately this defeat means we drop out of the automatic places with Sheff Utd jumping into the space. As I’ve said many times anyone can beat anyone in this division but both Sheff Utd and Norwich seem to be living charmed lives at the moment. It isn’t over by any means and we still have to go out and get as many points as we can. From shooting on sight at Reading we reverted to type by trying to walk the ball into the net or taking that one step too many instead of catching their goalie unawares. We could also have taken advantage of the wind behind us but sadly wasn’t to be. We now have a week off before Millwall at home with the LUDO dinner, dance on the same evening. I tried getting extra tickets for the Millwall game but was unsuccessful once again. Every time I chose tickets and tried to buy them it wouldn’t let me. Also even though sections were showing limited tickets they were all greyed out! You never know there may be the odd ones that come available before the game! See you there, LUFC – Marching on Together.